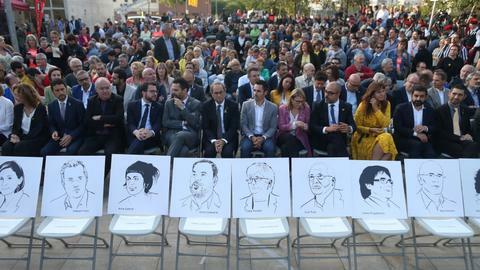 A dozen defendants are being tried on rebellion and other charges stemming from their roles in pushing ahead with a unilateral independence declaration of Catalonia in October 2017. 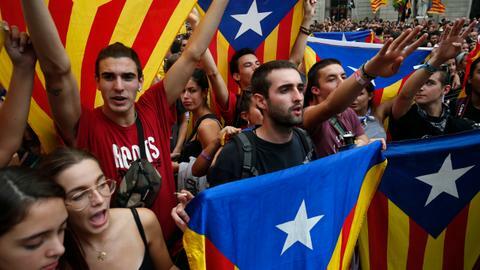 A sensitive trial against a dozen Catalan separatist politicians and activists got underway on Tuesday in Spain's Supreme Court amid protests by pro-independence supporters and a highly volatile political environment. Sanchez could be forced to call an early election if the Catalan separatists, whose support brought the Socialists to power last year, don't change their current position of voting against the prime minister's spending plan on Wednesday. "Under no circumstance will we admit that the right to self-determination in Catalonia appears in any talking points," she said. Journalist Jaime Velazquez explains what the atmosphere is like in Madrid. 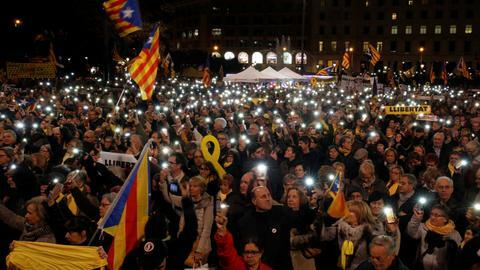 On Tuesday, pro-independence protesters briefly blocked highways in the northeastern region and roads in its capital, Barcelona. Former Catalan Vice President Oriol Junqueras, the regional parliament's former speaker Carme Forcadell and the other 10 defendants weren't expected to testify on Tuesday, but they sat on four benches in the middle of the courtroom. Holding papers in their hands and smiling at each other at times, the defendants sat facing a seven-judge panel headed by Supreme Court magistrate Manuel Marchena, who moderates the proceedings. Carles Puigdemont, Torra's predecessor who fled from Spain, called for the 12 separatists to be absolved for their alleged crimes and called the trial "a stress test for the Spanish democracy." Addressing reporters at a news conference in Berlin, the former Catalan leader added, "I trust, however, that the Spanish state will take advantage of this chance to issue the correct sentence, which is absolution." Puigdemont said all democracies around the world should be inspired "by the Catalan struggle for democracy and the image of our civil and political leaders on trial concerns all of (those) who believe in a stronger democracy." He also questioned why the European Union was "more concerned by that is going on in for example in Venezuela than what is happening in Madrid today." Those who stayed behind and showed up in court are the ones facing trial now. Puigdemont's No 2 at the time, Junqueras, faces up to 25 in prison if he's found guilty of rebellion, while others charged with sedition or misuse of public funds could get lower sentences if convicted. 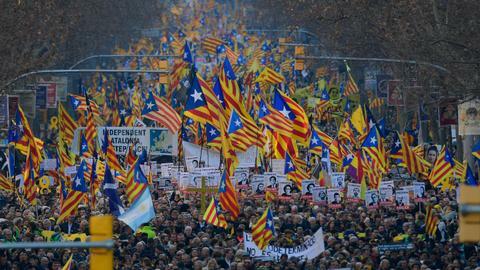 The proceedings were being broadcast live on TV in a display of transparency that aims to fight the separatists' attack on the court's credibility. 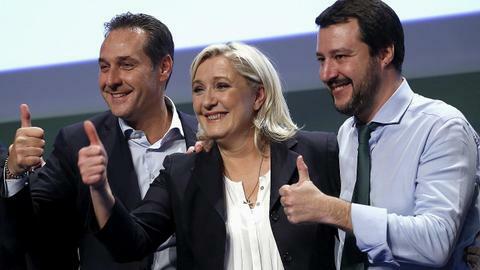 Authorities in Spain have dismissed the notion that the trial is political and say it follows the Europe Union's highest standards. Proceedings were likely to last for at least three months. The verdicts and any sentences will be delivered months later.